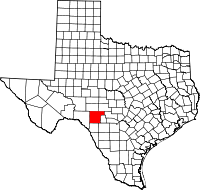 Edwards County is located in Southwest Texas east of the Big Bend country and 100 miles west of San Antonio. It is bordered by Val Verde and Sutton counties to the west and north, Kimble and Kerr counties to the northeast and east, Real and Uvalde counties to the southeast, and Kinney county to the south. Edwards County. Formed from Bexar County; created February 1, 1858. Organized September 10, 1883. Named in honor of Haden Edwards 1771-1849. Empresario leader of the Fredonian War in 1827. County seat, Leakey 1883 Rocksprings, since 1890. Historical Marker text, 1936. Marker location: from Rocksprings take US Highway 377 north approximately 2 miles. Edwards County. Atop the Edwards Plateau, extending into the scenic Nueces Valley. Angora goat capital of the world. The economy is based on ranching. Wild game is abundant. Created in 1858 and organized 1883 from old Bexar district. Named for Haden Edwards (1813-1865), an early leader and colonizer in Texas. First county seat was Leakey; present boundaries were created, and county seat was moved on April 13, 1891, to Rocksprings. First courthouse and jail were built that year. After a fire in 1897*, the present courthouse was erected; it withstood a destructive tornado that claimed 72 lives in the county in 1927. First officials to serve the county (1891-1893) as it is presently constituted were the following: James M. Hunter, County Judge; W. M. Sanford, County and District Clerk; Ira L. Wheat, Sheriff and Tax Collector; S.A. Hough, County Attorney; W.H. Cowan, County Treasurer County Commissioners: John Eaton, Precinct No. 1; C. H. Kirchner, Precinct No. 2; H. Schweithelm, Precinct No. 3; M. M. Bradford, Precinct No. 4 – Historical Marker text. Marker location: south end of courthouse square, Rocksprings. *Actually the fire was on Dec. 23, 1898 and is misquoted as 1897 on the Historical Marker and in several places on the internet. Also, the courthouse was rebuilt after the fire. The 1891 courthouse is in use today. Edwards County History from the Handbook of Texas Online. A History of Edwards County, 1984, by the Rocksprings Woman’s Club Historical Committee. Edwards County Courthouse from Texas Escapes.